Anyone who knows me can speak of my love for bowls. No two are alike – fine glass, smooth wood, ceramic or metal – these open vessels reflect not only the artist that created them but they also capture the eye of the beholder. Each person sees something different as they look down into the open space. I do find bowls intriguing – they can hold a story or items of treasure. Full or empty, holding objects or marking sacred space, bowls often draw attention from even the least observant. They can stir our imagination or calm our unsettled spirit. The image above is beautiful. A bowl is crafted to bring beauty and function. When we see a broken bowl, we often think of it as trash or collect the pieces of pottery for other use. 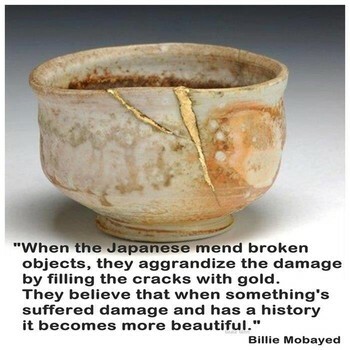 To hear of a tradition that fills the cracks in broken bowls with gold and sees the damage as a thing of beauty makes one stop and think. If bowls of clay can be treated with such care and honor, shouldn’t we respond to people among us who have been injured and in need of mending with the same respect and honor. In these first days of 2015, may we grow to see the beauty in this imperfect and broken world. May we work together to mend and mold a miracle of wholeness for ‘this fragile earth, our island home'(Book of Common Prayer, pg.370).